The cake was awesome all alone but add the Sea Salt Browned Butter Cream Cheese Frosting and it is over the top awesome! My neighbor Dawn asked me to make this cake for her husband's birthday party today. I am glad this is the cake he chose as it sounded terrific. You can not go wrong with Browned Butter anything and then add sea salt.....YUMMY! In the picture above is my browned butter. You can see the pretty amber color that it turns and it will smell amazing! In the other picture is the cakes after I had poked them with a dowel rod and smeared the salted caramel over the tops to soak in. 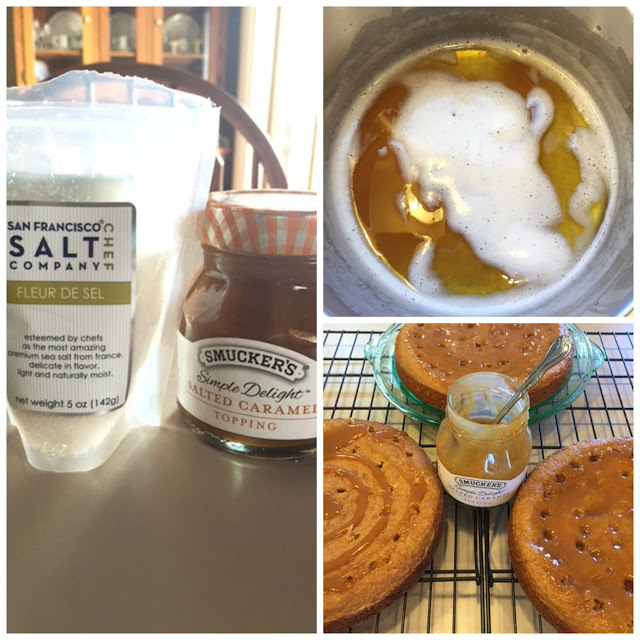 I did a little research online and found that a favorite of bakers is to use Fleur De Sel salt for their Sea Salt. I am not sure why but it does taste a little different from Sea Salt that you buy in your grocery store. I love the sweetness of icing with the taste of salt! You can do this as a two layer cake if you prefer, I just like the look of a three layer cake plus you get extra icing so that is a win! This is the picture of the actual Birthday Cake. The pictures prior to this one were from my practice cake. I always like to practice a cake before I actually take it to someone. That way I am sure I get all the glitches worked out before hand.... as in this cake with the practice I used 2 eggs but decided it was a little dry so today I used 3 eggs and it was much better. 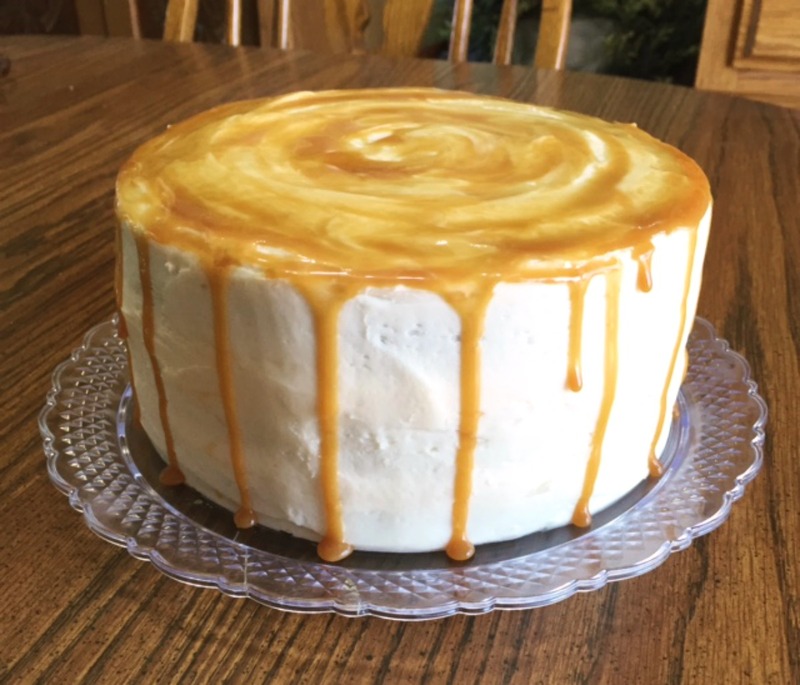 In another mixing bowl cream together butter, dark brown sugar, 1/4 cup caramel topping and 1/2 cup white sugar until combined. Slowly mix the egg mixture into the butter mixture. Add vanilla and mix until combined. Sift together the dry ingredients and add them to the mixing bowl alternately with the buttermilk. Butter and flour 3 8 inch round baking pans. Divide the batter between the 3 pans and bake for 20 minutes. Let cake cool in pans for about 5 minutes then take cake out of pans and cool on a cooling rack. Mix together the cream cheese and cooled browned butter. Add in the Fleur De Sel and vanilla. Alternately mix in the powdered sugar and whipping cream, scraping down the sides of the bowl as needed. 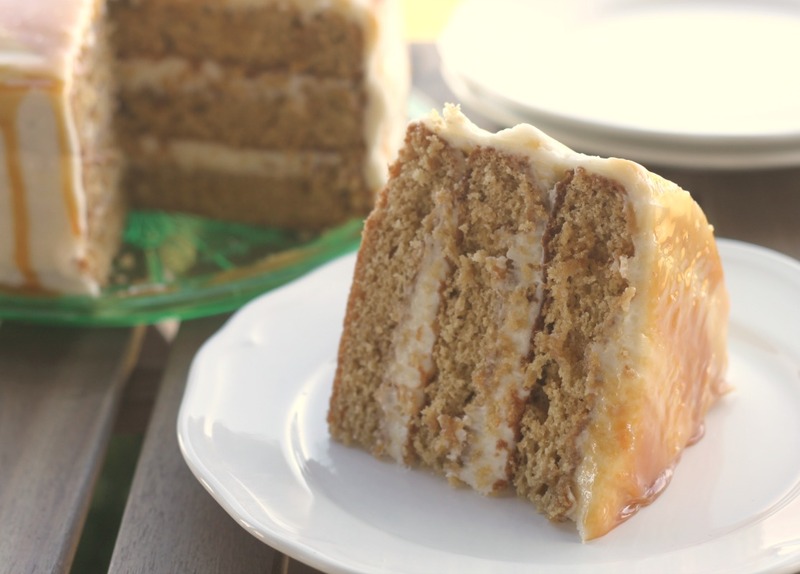 Place one layer on your cake plate and spread a layer of icing on top. Place the second layer on top and spread another layer of icing. Place the final layer on top and frost the outside of the cake. 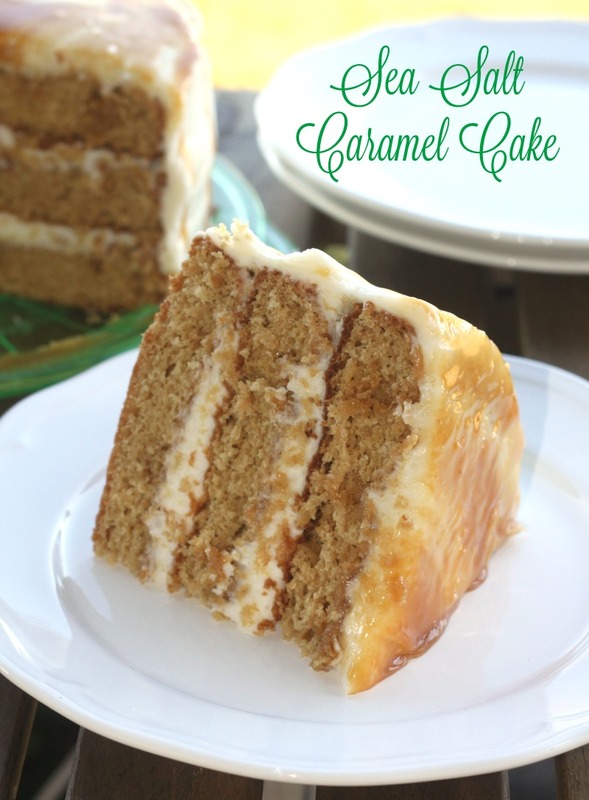 Spread a thin layer of caramel over the top of the cake and swirl around to the sides. 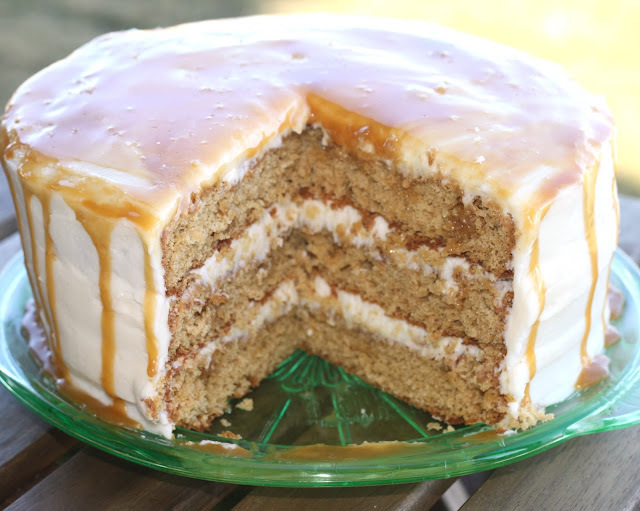 Put additional caramel into a disposable piping bag fitted with a small tip. Pipe a layer of sauce around the edge stopping about every inch or so to squeeze a little more caramel to run down the sides of the cake. Sprinkle the top of the cake with a pinch of Fleur De Sel.... enjoy!